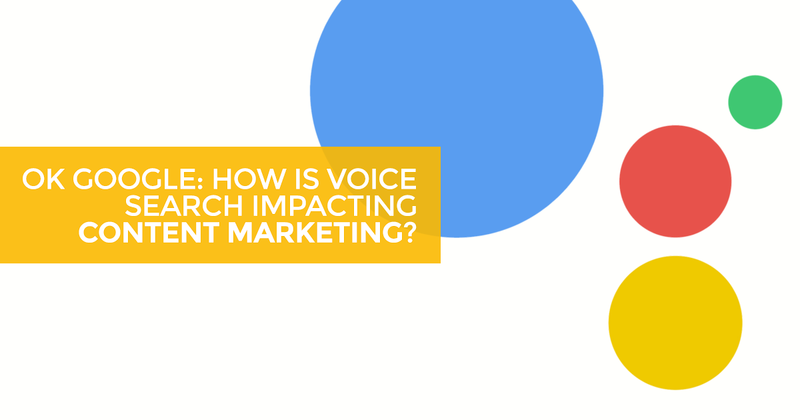 OK, Google: How is Voice Search Impacting Content Marketing? In the marketing world we know that “content is king;” we know that it’s imperative for ranking in the SERPs as well as essential for creating brand authenticity. As web users, we know that we rely on high-quality, authoritative content from companies and brands that we trust. Over the past three years, with a big push from Google, we have seen a shift from quantity to quality content transforming the way we expect to receive information online (see Google’s content quality guidelines here). In 2017, we now have access to more valuable content but we are also seeing a change in how it is searched. As an SEO that does a lot of content writing, I was curious about how voice search would shake things up for us digital marketers. In this blog, I’ll share a little about what voice search is, the projections for the future, how to prep content for voice as well as some content marketing basics for creating valuable content. Wait, What is Voice Search? If you use voice command on your smartphone or desktop that has a digital personal assistant, you are using voice search. From smartphones to Google Home to Amazon’s Echo, there is an undeniable trend towards voice search because it is easy, convenient, hands-free, and, honestly, just down-right fun. Let’s face it, we love to multi-task and voice search lets us do just that. For example, you’re in the kitchen cooking and instead of searching for how many cups in a quart, you ask, “OK Google, how many cups are in a quart?” Google responds, “there are 4 cups in a quart.” You didn’t even have to stop what you were doing. As you may suspect, because of this convenience, the number of voice search users is rapidly growing. Back in May, Google CEO Sundar Pichai announced during his Google I/O keynote, before the launch of Google Home, that 20 percent of queries on its mobile app and on Android devices are voice searches. That’s a huge percentage of voice search that will only grow over the coming years as technology advances. New audio-centric technologies, such as Google Home and Amazon’s Echo, are making access to dialogue-based information ubiquitous and spawning new platforms based on “voice-first” interactions. By eliminating the need to use ones’ hands and eyes for browsing, vocal interactions extend the utility of web sessions to contexts such as driving, cooking, walking, socializing, exercising and operating machinery. As a result, the share of waking hours devoid of instant access to online resources will approach zero. Just when we thought that having access to the internet was enough, the new norm will be “instant access to online resources” with minimal effort. The new norm changes the keyword based searches of the past to the natural language based searches of the future. How do I convey my brand’s tone in a natural language? Write content in your natural voice. When I say “natural voice” I don’t mean just free write something and then hit the publish button. You can write in your natural, honest tone and still thoughtfully edit before publishing a blog, article, or landing page to your site. The point is, that natural, conversational language uses more words than what is typically in typed searches. In this very near-future scenario, sites will rank for key phrases instead of keywords. That brings us to the next question and answer. Can I deliver the text-based information via voice search? Yes. Because voice search is query-centric (who, what, where, when, why, and how), write complete, full-sentence questions in your blogs, articles, landing pages and social media posts instead of breaking them up or making them into statements. Then, answer your own questions in full-sentence answers. Kind of like what I’m doing here. Again, don’t forget to implement long-tail keywords as longer queries originate from voice searches. Will I see a decrease in organic search traffic if users no longer need to click on actual web pages to access information? Unfortunately, yes and we have been seeing this for some time. With voice search, Google is able to organize information and make it accessible in the form of answer boxes and knowledge graphs so users don’t even have to click on SERP result. Google threw another curveball last year by moving paid ads from the side to the top of the search engine results (Ian wrote a blog about this very thing). This being said, to really suss out this question, I would need to write another blog. Finally, as we make our way into a new generation of search, I would like to discuss some core skills that we can’t really do without. Writing is so, so important. It should be obvious but SEOs need to have good, foundational writing skills because what are people searching for? What ranks? And why do users stay on a page? You guessed, content. The goal as an SEO is to make the best page on the web for your topic. So if you don’t feel confident in your writing skills, 2017 is the year to start beefing up on these skills. Take the time to research. As an SEO and content developer, you must research topics of interest, viable keywords, format styles and content layouts as well as who the industry authorities are (who is your competition?). This research will add depth and relevance to your content, and that’s why it's so important. Remember, it’s quality, not quantity. Analytics tells you what works and what doesn’t. Optimizing content is not set-it-and-forget-it, it’s a series of actions that are based on data. So without analytic tools, you have no idea if your content is winning or failing. Sometimes all you need is to make a tiny adjustment to see a big difference. We know that voice search is actively shaping the future of content writing and changing how SEO techniques are adopted in the mobile age. SEO and content development are constantly evolving, so our approach to it needs to constantly evolve too. If you feel like your skills are stronger in one area than the other, that’s okay. Think of how you use the internet and what kind of content you find valuable, then approach your content creation the same way.